I am so in love with this novel! Fade is deeply entrenched with Norse mythology, romance, and suspense. A.K. Morgen's young adult debut is absolutely a must-read, one that will keep your mind occupied from the first word! Fade opens as Arionna Jacobs grieves for the lost of her mother, her best friend. The grief does a significant number on her attitude and ability to live fully, but she resolves to be strong. When she encounters Dace Matthews at her new college her perspective changes and the heartache from the death of her mother lessens. Dace and Arionna are probably one of my favorite fictional couples. They have a familiar connection that scares them both, but neither knows more than the other so they're on level ground. Morgen builds their relationship from the ground up, even though their familiarity comes from being together lifetime after lifetime. Morgen's writing style allows you to feel as though you're living the moment with Arionna. The scenes are well-written and as realistic as possible in a fantasy novel. Sometimes Arionna's internal dialogue is slightly redundant as she brings up the same worries and thoughts while applying them to every new situation that comes up. It doesn't take away from the progression of the novel, but by the middle of the story I just wanted to focus on what was coming and not what had already been discussed. Arionna's ability to communicate with Dace and his wolf was certainly intriguing and led to a very endearing side of her. A great part of my enjoyment of this novel came from how freely Arionna could give herself to people and others she didn't know, especially in the midst of a looming future she didn't understand. The beginning of The Ragnarök Prophesies is surely one to read. 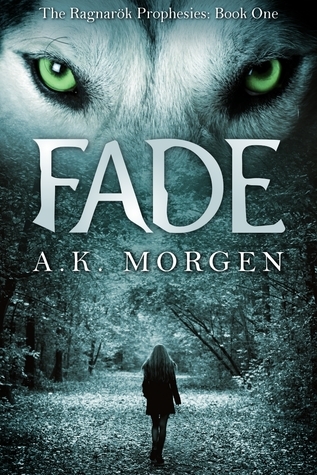 Fade is just what I expected, but Morgen gave it a little extra. The strong connection to Arionna will carry you through the novel and perhaps all the ones that follow! Wow, it sounds pretty cool. I love what you said about the mind-reading thing, that it's not like the most of the books when one of the guys knows exactly why they can read the other's mind. I like that they're both on the same level. This book looks pretty interesting. The mind reading thing is cool too. Thanks for your thoughts!